Aircraft Radar uses live ADS-B radio signals, collected by volunteers, to tell you what airplanes are around you. Data from ADS-B Exchange makes this skill possible. Please consider donating to them if you enjoy Aircraft Radar. 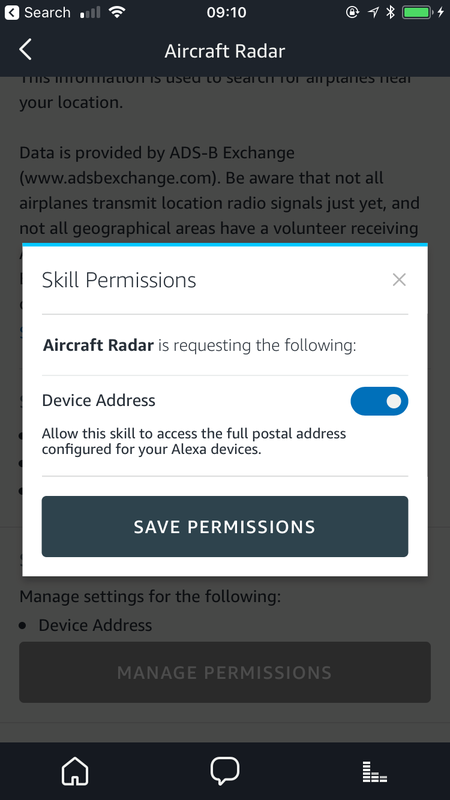 Click “Enable Skill” on the Aircraft Radar skill page, or ask Alexa to enable the Aircraft Radar skill. Generally, you can ask Aircraft Radar for airplanes that are “nearby” or “overhead”. “Nearby” looks for aircraft within 40km of you; and “overhead” only looks for aircraft within 15km of you. Aircraft Radar will tell you about the 4 nearest aircraft that match your search. Aircraft data is provided by ADS-B Exchange. You should donate to ADS-B Exchange if you enjoy this skill. Be aware that not all airplanes transmit ADS-B data just yet, and not all geographical areas have a volunteer receiving ADS-B transmissions from nearby aircraft. Consider running your own receiver and feeding the results to ADS-B Exchange if you want to help improve this skill. I pay out of pocket for a $5/month DigitalOcean virtual server which provides a critical caching layer for the Aircraft Radar service. Consider also donating to ADS-B Exchange, the project which makes this skill possible. Please send feedback via the bug tracker or via email to chris@dzombak.com. The Aircraft Radar skill is developed and run by Chris Dzombak.